This week, one hundred years ago at Cork City Hall, the distribution of 100 certificates to the successful pupils of the Cork Municipal School of Music for the Session 1915-1916 took place. Lord Mayor Butterfield and the Lady Mayoress presided over a large attendance. Locally there was great pride in the School. Over the previous years, students at the school had won many distinctions at various examinations and the school frequently published celebratory public notices in newspapers like the Cork Examiner. All of them were attempts to keep music as a key subject on the agenda of national technical education as well as keeping funding streams in place and helping with fundraising for a new school building. In March 1917, the chairman of the School Committee, Mr P Curtis noted that through publicity he was attempting to showcase the “true value of the school and the talent of the pupils produced” through tuition in pianoforte, violin, cello, organ, voice, elocution, theory of music, harmony, orchestration and choral work. The Cork School of Music was established in 1878 at 51 Grand Parade with four rooms catering for an initial enrolment of 161 students and a staff of five. In the year 1900, the Committee of the School decided to seek more suitable premises, and a move was made to 8 Morrison’s Island. Three years later during the in winter of 1903 operations were transferred to a large house at 13 Union Quay (being replaced by two new buildings in time, one opening in 1956 and the other in 2007). 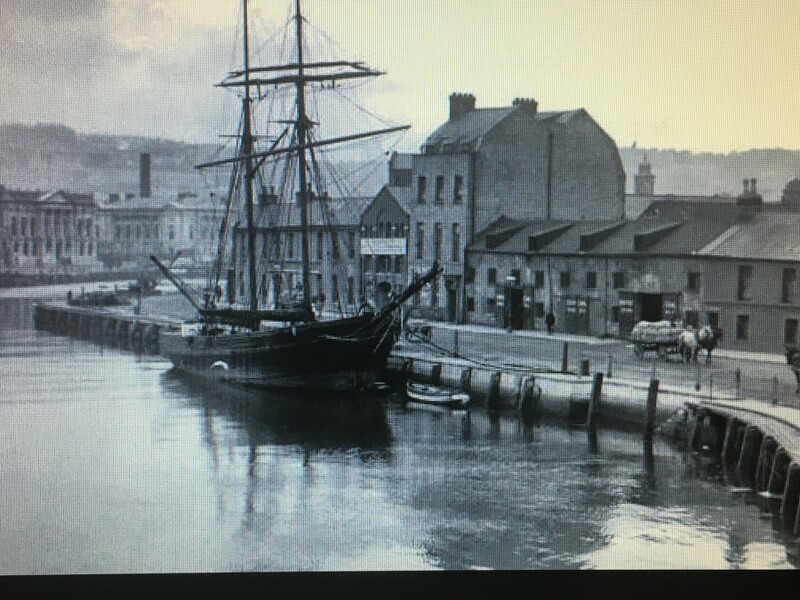 Union Quay in Guy’s Directory of Cork for 1903 lists a variety of different trades. It had a number of vintners – Edmond Heaphy (no.1), Mary Fleming (no.2), John O’Connor (no.3) and William Drinan (no.4) – as well as businesses such as the Cork Co-operative Creamery Federation Ltd (no.5), D Williams’ Union Quay Carriage Works (no.s 6-7), T E Jacob & Co Ltd, flour and meal store (no.8), Newsom & Sons Ltd sugar store (no.9), Constabulary Barrack (no.9a), Thomas O’Brien auctioneer and valuer, horse, cattle, and sheep repository (no.s 10-11), W Dalton’s Cork Electric Bakery (no.12), Richardson Bros, manure Depot and Johnson & Co Ltd, cement manufacture (no.14), John Fitzgerald’s corn stores (no.s 16-17), Madden Michael, vintner (no.19), and J O’Connor’s City Saw mills (no.20). 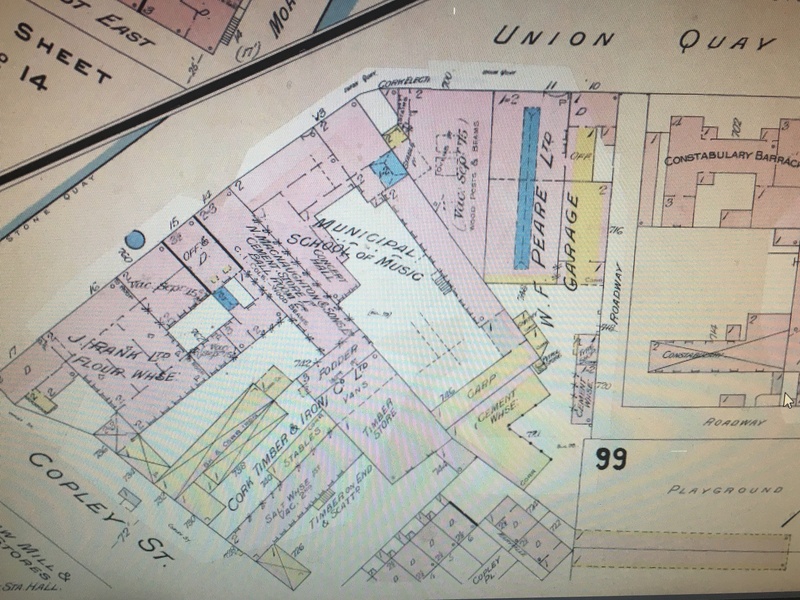 In the 1903-1904 annual report on technical education in the city, only a portion of no.13 Union Quay was used as a school of music – the remainder being allotted to a kitchen equipped for twenty students, a plumber’s workshop, a painter’s and decorator’s room. A beginning was made in the formation of a small botanical garden in the grounds attached to the buildings. By 1917 the teachers at the school were internationally known – Cambridge scholar William Henry Hannaford taught pianoforte and theory with Wilberforce Franklin of voice production, Signor Ferrouccio Grossi of violin, viola, and conductor of orchestra, Theo Gmür, of the organ, sight-singing, and conductor of choral clans; Michael O’Grady taught Irish National Music and traditional Irish singing with E Rawlinson of violoncello, P Minton of the clarinet, Mrs W Franklin of elocution, Miss Swaffield of pianoforte and Miss Anna O’Donoghue. The superintendent was Miss Mary Barker. Some background can be gleamed on the background of the above teachers. For example, the organ teacher Theo Gmür was Swiss born. His obituary for 1929 reveals he came to Cork City as a young man, and rapidly gained a reputation as organist and choirmaster. His first appointment was at SS Peter and Paul Church, where he remained as director of the choir up to the time of his death. He became prominent by his active work at the Cork Young Ireland Society’s concerts, City Hall concerts, the Cork Municipal School of Music Choral Society, the Cork Musical Club and Cork Operatic Society. Gmür was musical director of the Cork International Exhibition of 1902 and 1903 and was an Honorary Academician of Trinity College, London, was one of the members of the preliminary committee of the Feis Ceoil, Dublin and was an examiner for many famous colleges. The March presentation of certificates in 1917 coincided with the hosting of a public concert of orchestral selections, piano duets, violin soles and solo singers. At the interval in the concert, Mr P Curtis, Chairman of the committee of the School, addressed the audience. He was glad to report, that for the year 1914-15 the number of students increased to 439 from 312. He read from the examination report by Dr Annie Patterson (organist with St Anne’s Church, Shandon), which praised the practical musical education on offer to students. He referred to special distinctions gained by students of the School during the past session. Mr T J Collins, tenor, was singled out. During the concert, he received an ovation for his singing of the Prologue from Pagliacci. He had during the year won the O’Mara cup and gold medal in singing at the Feis Ceoil in Dublin. Mr J L Fawsitt committee member, noted that the School deserved the support of the citizens, and had the committee more money, much more could be done. He appealed to the citizens with financial means; “Rise to the occasion and give the School a building, which would be a credit to Cork and ample space to accommodate all the young Cork artists, who would throne their halls in the near future”.